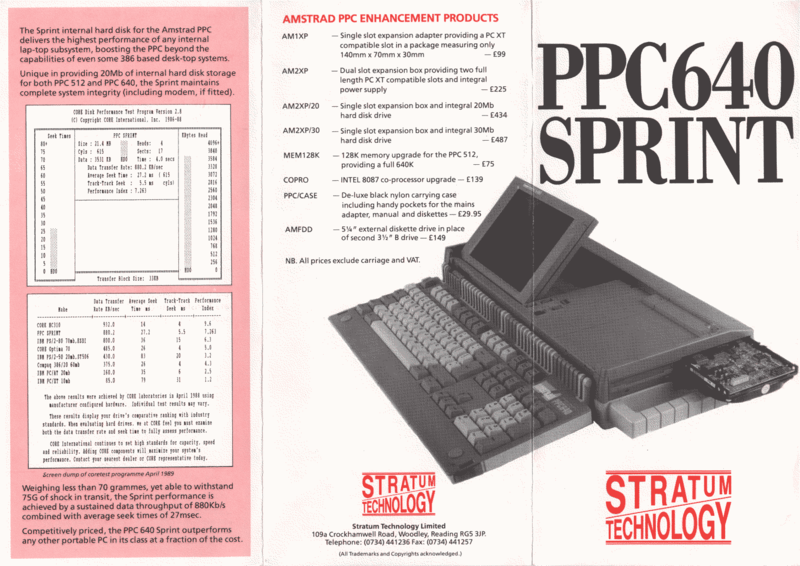 The Sprint is an internal hard drive for a PPC laptop. The drive itself is a 3.5" IDE type, occupying the position normally used by the second floppy drive. 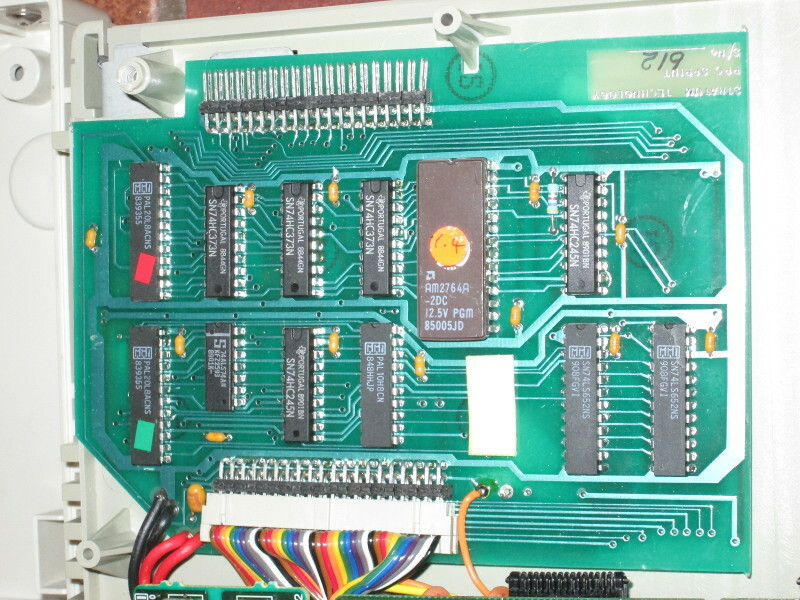 Its interface occupies the area of the case used by the PPC's modem, and is connected to the PPC's motherboard by means of a soldered ribbon cable. 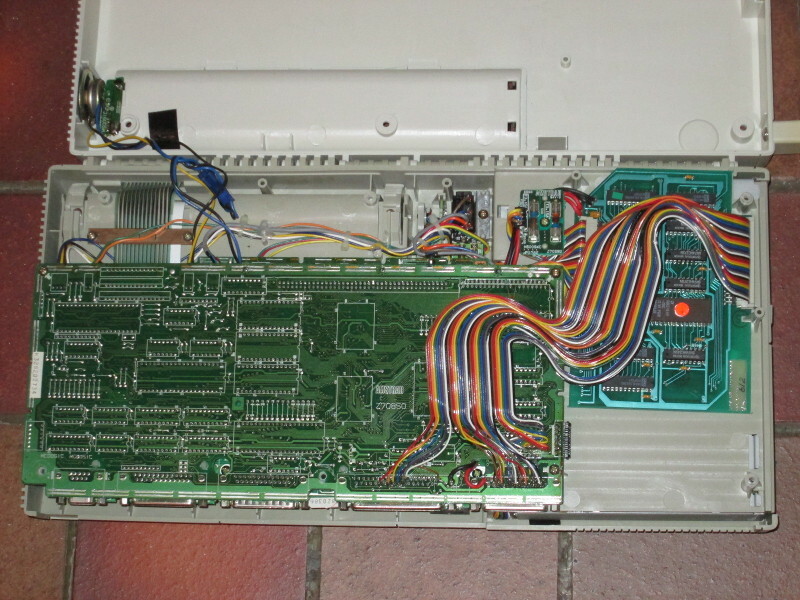 On a PPC with a modem fitted, the interface would presumably sit behind the modem PCB. On my specimen, the hard drive is a 21Mb Conner CP3024, which has succumbed to gooey sealant syndrome. Substituting a replacement drive of a different type would not be straightforward, because the power connection used is the 3-pin one found on only a few hard drives of that period. The interface does not appear to be compatible with CompactFlash cards used through an adaptor, either. 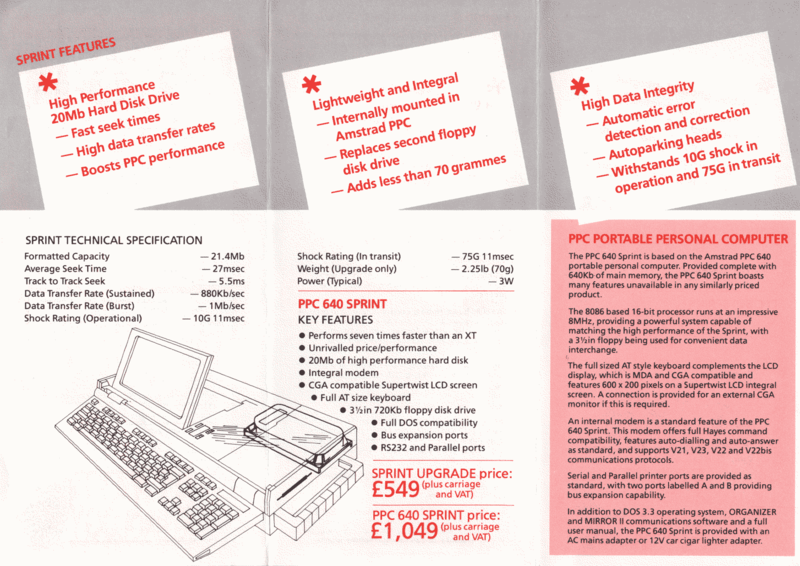 The drive interface includes a ROM, BIOS, which signs on as 'Broomsleigh Disc BIOS version 1.4.0' and includes the copyright message '(C) Copyright R.T.J.Woollett 1988,1989'. It provides the usual BIOS services on INT 0x13 and INT 0x19, allowing the PPC to access the hard drive and boot from it. The BIOS also sets up the hard drive geometry table on INT 0x41. It supports two hard drive geometries — one with 615 cylinders, 4 heads, 17 sectors (~20Mb) and one with 980 cylinders, 5 heads, 17 sectors (~40Mb). It uses INT 0x13/AX=0x1F00 to identify the drive, and selects the 40Mb geometry if the IDENTIFY result reports 1000 or more cylinders. The BIOS only supports one hard drive (drive 0x80). 0x1F8: Read at the start of a transfer to/from disk. Possibly to initialize DMA? 0x1FA: Read at the end of a transfer to/from disk. Possibly to finalize DMA?